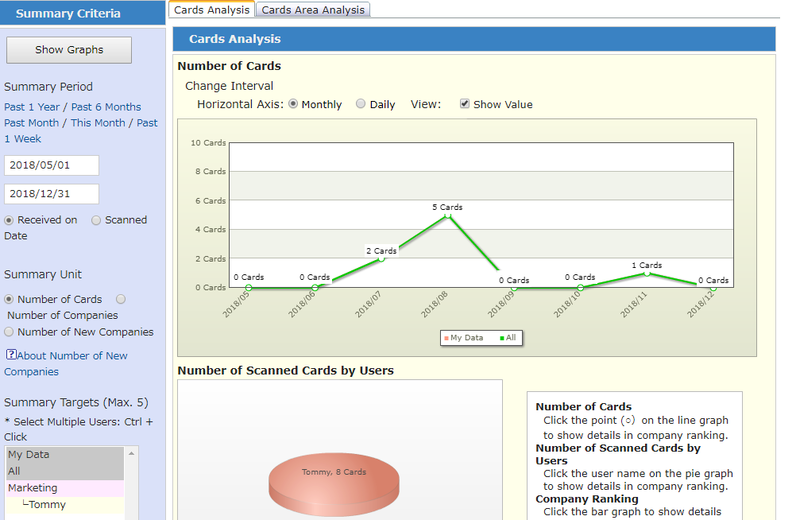 Cards Analysis is a function for visualizing the business cards processed by each user (holder) or from each company. Here we will show how to use this function. For checking the number of business cards processed, there are two ways, the way described here and the way of checking from the tablet PC. For the way described here, the following three types of cards will not be counted, so there may be some discrepancy between this number and the number from the tablet PC. If you would like to check the number of free scans you have left, please use the tablet PC. 1. From "Reports", select "Cards Analysis". 2. You can check number of cards processed by month or by day, counting "Number of Cards", "Number of Companies", and "Number of New Companies". 3. As necessary, set options. Count cards scanned by Sansan Scanner or Smartphone : With this you can include cards scanned by camera apps (including the Smartphone application, and Smartphone web). 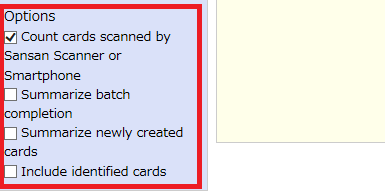 Summarize batch completion : With this you can include cards that were registered by data import(*). Summarize newly created cards : With this you can include cards that were created by the user. Include identified cards : With this you can include cards that have been processed as cards from the same person. (*) By this is meant not the ones from "Admin Settings", then "Import Card Data", but cards imported by our company for a fee.